I love buying unique and fun clothes for my boys. They love it too – they always get excited when I bring home something new for them to wear. My youngest son Noah now has a new t-shirt that he loves courtesy of Charm City Babies – a company that not only offers great quality clothes, but is also on a mission to help those in need! 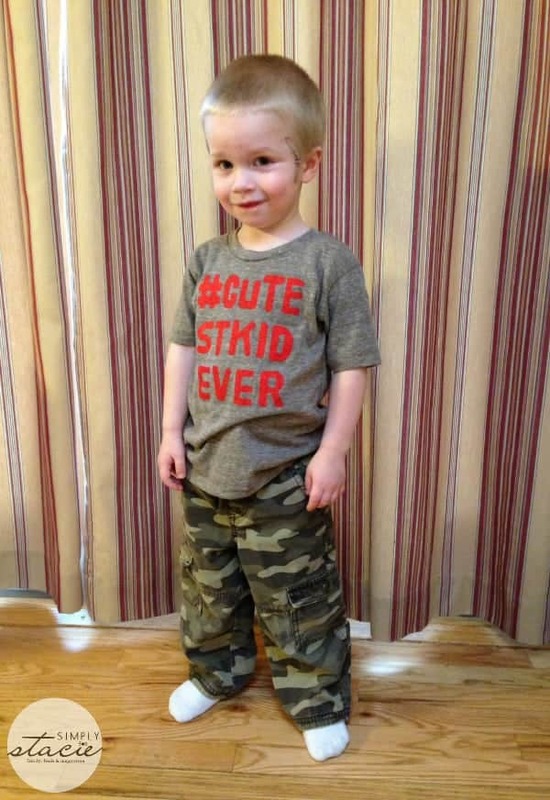 We received a toddler #cutestkidever t-shirt from Charm City Babies for review. Noah is an average-sized three-year-old and the 3T size fits him perfectly. The t-shirt is soft and light, perfect for the warmer weather that’s finally arriving here in NY. This shirt is a 50% Polyester, 38% Cotton, 12% Rayon blend and it washed well in my usual cold water wash – I really didn’t notice any shrinkage. I happen to like the hashtag design – perfect for a kid of a blogger! 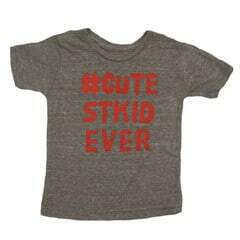 This t-shirt comes in sizes 2T – 4T, it’s also available in green, and sells for $19 on the Charm City Babies site. Charm City Babies is more than just a fun site to shop – they are a company on a mission to help children in need through their Buy One, Give One Program. For every shirt they sell through their online store, they provide a shirt to a child in need through several charities, NICUs, hospitals and youth organizations that they partner with. Their aim with this program is to #makeadifference every day. Charm City Babies was started by co-founders Scott Smith and Richie Frieman, who share many of the same interests including music, pop culture, vintage designs, a good t-shirt, and most importantly, their families. As fathers of little ones themselves, Scott and Richie were disenchanted by the limited and basic offerings of designs on children’s clothes and wanted to do something about it, and so Charm City Babies was born. They also decided that they wanted to do more than just keep babies looking cool – they wanted to help out those in need. By donating a piece of clothing to charity for every one sold through their website, Richie and Scott are not only helping those in need, but are also helping to spread the Charm City Babies style. Check out the Charm City Babies site for cool, fun, and unique toddler and adult t-shirts, toddler sweatshirts, and long and short sleeve baby onesies. I love the little lion toddler tee. I like Respect The Stache – Royal onesie. Love the Charm City Strickers tee. I love the toddler shirt Eat Sleep Rock Repeat! I like the adult tshirt: I dig music! I like the guitar lessons onesie! love the guitar lessons onesie!! I love the Bmore Ball – Orange onesie…we are from baltimore…thanks for showing me a local company! I like the #cutestkidever sweatshirt in pink. I love the Respect the Stache shirt! i like the i dig music shirt in black. I liked the Eat. Sleep. Rock. Repeat. – Black for my niece. Love the #cutestbabyever long sleeved onesie. I like the guitar lessons onesie. I like the I Dig Music-Purple shirt.